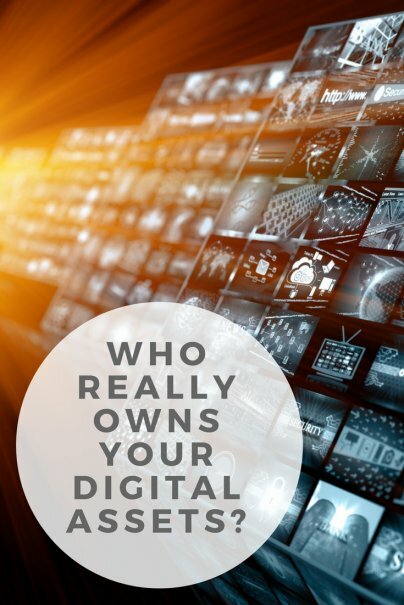 Home » Personal Finance » Who Really Owns Your Digital Assets? Throughout your life, you accumulate a wide variety of assets, including cash, real estate, and vehicles. But you've also probably been collecting assets of the digital kind — whether that be music downloads, frequent flyer miles, or cryptocurrency. When you put so many of your hard-earned dollars into virtual goods, there are some important considerations to keep in mind if you want to pass them on to your heirs. Many people think of digital assets as digital copies of things that you purchase online, such as music or ebooks, but there are other types of digital assets. They include things that you store in virtual storage systems, such as Dropbox or iCloud. Some examples are photographs in your Flickr account, financial documents in your Box account, and bitcoins in your Coinbase account. Social media accounts are also digital assets. Even if they don't have any monetary value, the contents may be something you want to bequeath to your heirs. It can be easy to assign a dollar value to some digital assets, and difficult for others. The dollar value of an online-only savings account, for example, is as straightforward as it gets. On the other hand, a photo collection of the first 10 years of your son's life could be worth several thousands of dollars to you and nothing to the average Joe. Here are some best practices for taking care of your digital assets once you're no longer in the picture. Just because you hit the "Buy now" button for a digital file doesn't really mean that it's yours. Unlike physical books, CDs, DVDs, or vinyl records, purchasing digital works grants you no ownership rights. Most companies just license you the right to access and use the song or video. In other words, you don't own the asset and you can't get around that fact by giving your account password to anyone else. If you haven't already, you need to create a last will and testament. But whether you can include a particular digital asset in the will depends. Not only must you actually own the digital asset, but also you must be able to transfer it. Air Miles Canada allows you to transfer ownership of air miles at no charge when an account holder has passed away. American Airlines' AAdvantage program indicates that "mileage credit is not transferable" even to estates, successors, or assigns. However, American Airlines includes a clause that it may make exemptions upon its sole discretion and payment of any applicable fees. Delta SkyMiles clearly outlines that "Miles are not the property of any member" and may not be transferred under any circumstances, including death. This is key. While your executor (the person executing your estate after your die) will need your login credentials to access your digital assets, they will have no legal authority to access your passwords under most state jurisdictions. So, plan to leave a letter to your executor with the usernames and passwords of the accounts that you would like to pass on to beneficiaries. While a simple letter containing the account information can do the trick, there are also several digital alternatives. Some digital services that allow you to pass on digital assets are Password Box's Legacy Locker and YouDeparted.com. Some companies are already taking steps to plan your digital afterlife. Google's Inactive Account Manager allows you to instruct Google to transfer data from several services, including Google+, Picasa Web Albums, and YouTube to specific individuals after three to 12 months of inactivity. Facebook can "memorialize" an account after its owner has passed away. All types of banking and investment accounts provide you the option to designate a beneficiary. Without a beneficiary, your account will most likely end up in probate. While some states may grant your family some protection, designating a beneficiary well in advance is the best way to make sure that your digital moneys reach the right person(s). You can change the beneficiary of your account as many times as you need. Every time that you go through a major life change, such as marriage, birth of a child, or retirement, you should revisit who your beneficiaries are. In 2014, Delaware became the first state to sign legislation (House Bill 435) granting families the right to the digital assets of loved ones who become incapacitated or pass away. The law includes a wide rage of digital assets, including computer programs, audio files, images, and more. It's reasonable to expect similar legislation to appear in other states. Even when the company has a reputation of not budging and an airtight user agreement, tell your beneficiaries to try anyway. You never know when a company may make an exception. Airlines, in particular, are often willing to work with survivors who want access to a spouse's frequent flyer miles.